Flt3 ligand (Flt3-L) is a growth factor for dendritic cells and induces type 1 T cell responses. We recently reported that Flt3-L prevented OVA-induced allergic airway inflammation and suppressed late allergic response and airway hyper-responsiveness (AHR). In the present study we examined whether Flt3-L reversed allergic airway inflammation in an established model of asthma. 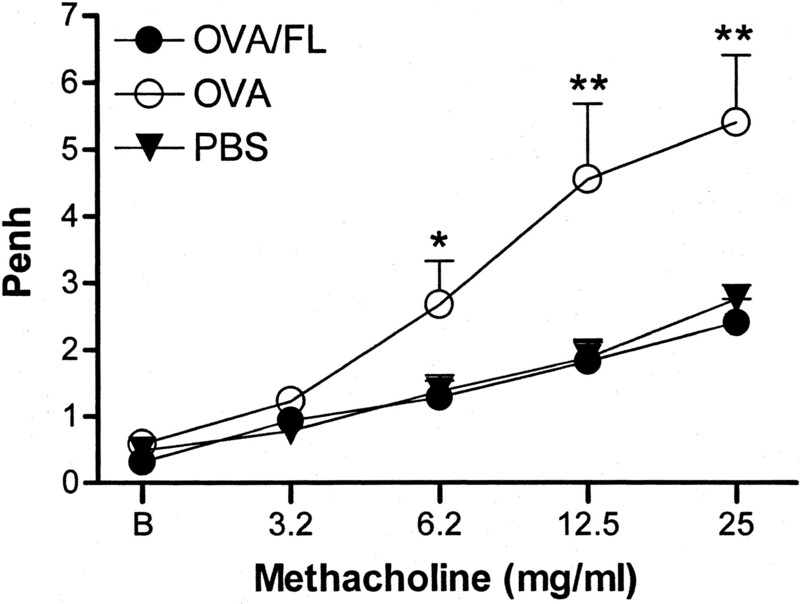 BALB/c mice were sensitized and challenged with OVA, and AHR to methacholine was established. Then mice with AHR were randomized and treated with PBS or 6 μg of Flt3-L i.p. for 10 days. Pulmonary functions and AHR to methacholine were examined after rechallenge with OVA. Treatment with Flt3-L of presensitized mice significantly suppressed (p < 0.001) the late allergic response, AHR, bronchoalveolar lavage fluid total cellularity, absolute eosinophil counts, and inflammation in the lung tissue. There was a significant decrease in proinflammatory cytokines (TNF-α, IL-4, and IL-5) in bronchoalveolar lavage fluid, with a significant increase in serum IL-12 and a decrease in serum IL-5 levels. There was no significant effect of Flt3-L treatment on serum IL-4 and serum total IgE levels. 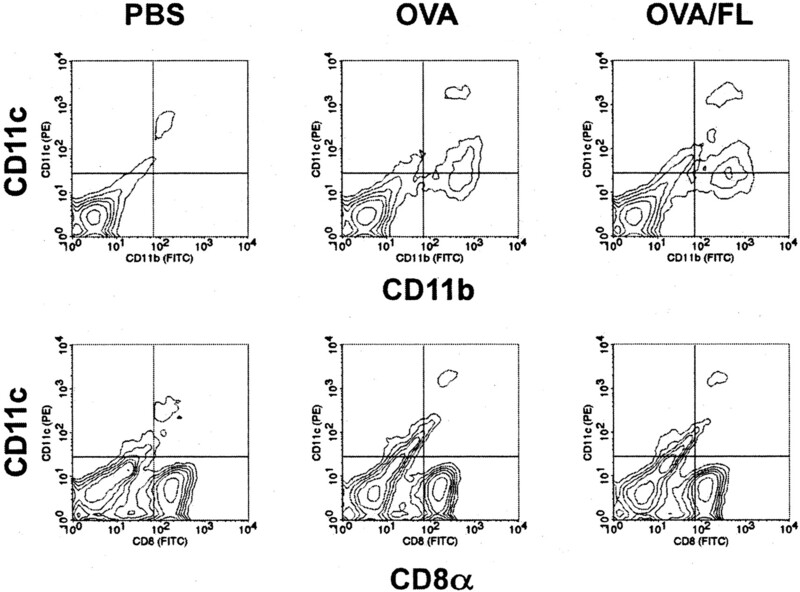 Sensitization with OVA significantly increased CD11b+CD11c+ cells in the lung, and this phenomenon was not significantly affected by Flt3-L treatment. These data suggest that Flt3-L can reverse allergic airway inflammation and associated changes in pulmonary functions in murine asthma model. Allergic asthma is a chronic disease of the lungs associated with bronchoconstriction and chronic inflammation of the airways. Several immune cells and mediators are responsible for aggravation and development of allergy and asthma (1). Consequently, it is not surprising that there are many possible modalities to treat the ailment (2, 3, 4, 5, 6, 7). Since the identification of distinct Th cell subsets that differ in cytokine production and effector functions as they relate to allergic asthma, a challenging concept has evolved to allow the use of therapeutic modalities that will modulate Th1/Th2 balance in asthma without deleterious side effects (8, 9). Primarily, these concepts have focused on modulation of Ag presentation to T cells and inhibition of Ag-specific Th2 responses and/or increasing the Th1 response (10). Thus, the suppression of Th2 cytokines (IL-4, IL-5, and IL-13) has been implicated as an approach to suppress airway inflammation and hyper-responsiveness. In this regard, several studies have been reported that detail the prevention of Th2-mediated allergic airway inflammation. In recent years various immunomodulators, including anti-IgE (11); anti-cytokine Abs (12, 13); probiotics (14); CpG (15); synthetic YpG, CpR, and YpR immunostimulatory motifs (16); and mycobacterial Ags (17), which can up-regulate a type 1 T cell response, have shown therapeutic activity for allergen-induced asthma in both experimental animal models (2, 18) and a few clinical studies (19, 20). However, many of these immunomodulators elicit serious side effects. For example, treatment with mycobacterial Ags may cause latent infection and loss of delayed-type hypersensitivity skin testing for mycobacterial infection (21, 22). IL-12 therapy elicits several toxic effects, including a flu-like syndrome, transient increases in serum hepatic transaminases., and cardiac arrhythmia (23). Flt3 ligand (Flt3-L),3 a recently described cytokine (24), has been shown to play a central role in the proliferation and differentiation of early hemopoietic precursor stem cells in both humans and mice (25, 26, 27). It has also been shown to induce proliferation and differentiation of dendritic cells (DCs) (28, 29), which have potent immunoregulatory properties (30). One subset of DCs (CD8α+; also known as lymphoid DCs) (31) secretes relatively higher concentration of type 1 cytokines, such as IL-2 and IL-12, and another subset (CD8α−; also known as myeloid DCs) secretes relatively higher concentrations of type 2 cytokines, such as IL-4 and IL-5 (32). Flt3-L treatment induces a preferential increase in IL-12 and Th1 responses by DCs (33, 34). As type 2 T cells predominate in asthma, and IL-12 production is clearly correlated with sensitization of Th1 lymphocytes in vitro and in vivo (35), Flt3-L has the potential to modulate the type 1/type 2 T cell profile in allergic asthma. Four- to 5-wk-old female BALB/c mice were purchased from Harlan Laboratories (Indianapolis, IN) and were housed in separate cages according to treatment protocol. Food and water were provided ad libitum. According to National Institutes of Health guidelines, the research protocol of this study was approved by the institutional animal care and use committee of Creighton University (Omaha, NE). Allergic airway inflammation was induced by i.p. injection of 20 μg of grade V chicken egg OVA (Sigma-Aldrich, St. Louis, MO) emulsified in 2.25 mg of Imject alum (Pierce, Rockford, IL) in total volume of 100 μl on days 1 and 14, followed by aerosol sensitization with 1% OVA for 20 min using an Ultra-Neb 90 nebulizer (De Villbiss, Somerset, PA) on days 28, 29, and 30. Mice were again challenged with OVA on day 32, and 24 h later AHR to methacholine was established (Fig. 1⇓). Starting on day 33, OVA-sensitized mice with AHR were randomized into two groups; the first experimental group received i.p. 6 μg of Flt3-L for 10 days, and the second group received i.p. sterile PBS for 10 days. On day 43, mice were challenged with 5% aerosolized OVA, and the final enhanced pause (Penh) values for early and late allergic response were recorded. Nonsensitized control mice were treated with vehicle only (sterile PBS). Experimental protocol for Ag sensitization and challenge to induce allergic airway inflammation and treatment with Flt3-L. BALB/c mice were sensitized to OVA by i.p. injection and subsequently challenged with OVA by aerosolization on days 28, 29, 30, and 32. After establishment of AHR to methacholine on day 33, animals in the OVA-sensitized and -challenged group were further randomized into two groups; one group was treated with Flt3-L i.p (n = 8) for 10 days, and the other group received endotoxin-free PBS alone (n = 8). Nonsensitized control mice received PBS only (n = 6). All three groups of mice were rechallenged with OVA on day 43 to measure EAR and LAR, followed by measurement of AHR to methacholine on day 44. A single-chamber, whole-body plethysmograph (Buxco Electronics, Troy, NY), without the use of anesthesia or restraint, was used to measure pulmonary functions. This method has been demonstrated to accurately reflect airway resistance, expressed as Penh units (37), in asthma models (38). On day 32 mice were challenged with 5% OVA for 20 min, and 24 h after the Ag challenge a dose-response curve to methacholine was generated, and AHR to methacholine was established (Fig. 1⇑). After treatment with PBS or Flt3-L, mice were again challenged with OVA on day 43, and Penh in response to Ag challenge was continuously recorded for 11 h to determine the EAR and LAR. The area under the curve was determined as previously described (18) for each animal using the baseline and Penh values from 0 to 15 min for EAR and from 1 to 6 h for LAR (PRISM version 3 statistical software; GraphPad, San Diego, CA). On day 44, 24 h after OVA challenge, mice were again placed within the chambers and challenged with increasing doses of methacholine (Sigma-Aldrich) to measure AHR, and Penh in response to methacholine challenge was recorded and expressed as the absolute Penh units. Blood collected after sacrifice on day 44 was immediately centrifuged, and serum was separated and stored at −80°C for later analysis. ELISA for total IgE was conducted as previously described (39) and according to the manufacturer’s recommendations using rat anti-mouse IgE (BD PharMingen, San Diego, CA), IgE standard (BD PharMingen), and rat anti-mouse IgE-HRP (Southern Biotechnology Associates, Birmingham, AL) for the total IgE assay. IgE assays were developed with 3,3′,5,5′-tetramethylbenzidine substrate and read at 450 nm using a microplate reader and software (Bio-Rad, Hercules, CA). Sensitivity for total IgE was 1 ng/ml. Total serum IgG subclasses were determined using rat anti-mouse IgG2a or rat anti-mouse IgG1 (BD PharMingen), IgG2a or IgG1 standard (BD PharMingen), and rat anti-mouse IgG2a-HRP or rat anti-mouse IgG1-HRP (BD PharMingen). Serum levels of anti-OVA IgGs were determined as previously described (40), Briefly, microtiter plates were coated with 100 μg/ml chicken egg OVA. The coated plates were washed several times with PBS containing 0.05% Tween (PBS-T) and blocked with 10% FBS for 2 h at 37°C. Diluted serum was incubated in duplicate overnight, washed with PBS-T, and incubated with anti-mouse avidin conjugates (IgG1 or IgG2a; BD PharMingen) for 2 h, and washed several times with PBS-T. Assays were developed with tetramethylbenzidene substrate reagent (BD PharMingen), and reactions were stopped with 2 N H2SO4 and read at 450 nm using a Bio-Rad microplate reader and software. BAL fluid (BALF) was collected from each animal via cannulation of the exposed trachea and gentle flushing of the lungs with 1 ml of warm sterile PBS. Total cell counts were determined by counting the cells in a hemocytometer. BALF was centrifuged, and the supernatant was collected and immediately frozen for later cytokine measurement. Cells were suspended in sterile PBS, and cytospin slides were stained (Hema 3 stain set; Biochemical Sciences, Swedesboro, NJ) for differential counts. Serum cytokines (IL-4, IL-5, IFN-γ, and IL-12) were measured by ELISA. Ab pairs for individual cytokines as well as standards were used according to the manufacturer’s recommendations (BD PharMingen) using streptavidin-HRP and 3,3′,5,5′-tetramethyl benzidine (Sigma-Aldrich). The sensitivity of the assays was 3–5 pg/ml. Cytokines (TNF-α, IL-2, IL-4, IL-5, and IFN-γ) in BALF were measured by flow cytometric analysis using mouse Th1/Th2 cytokine cytometric bead array kit (BD PharMingen). Immediately after the last challenge with methacholine, the lungs were fixed in 10% formalin, dehydrated, mounted in paraffin, sectioned, and stained with H&E. Airway mucus was identified by the periodic acid-Schiff (PAS; Sigma-Aldrich) reaction using a standard protocol recommended by the manufacturer. The severity of the inflammatory response and mucous cell metaplasia were scored on a scale of 1–4 according to the peribronchial inflammation by two independent examiners. A score of 1 was given for no inflammation, 2 for minimal accumulation of inflammatory cells, 3 for moderate accumulation of inflammatory cells, and 4 for severe accumulation of inflammatory cells. The density of PAS staining was scored as 1 for no mucous cells in the airway epithelium, 2 for minimal mucous cells, 3 for moderate mucous cells, and 4 for severe accumulation of mucous cells in the airways. After recording pulmonary functions and measurement of AHR to methacholine lungs of animals were processed to isolate DCs using MACS CD11c (N418) microbeads (Miltenyi Biotec, Auburn, CA). Briefly, after removing the blood, lungs were excised, washed with PBS, and digested with collagenase D (1 mg/ml) in HEPES medium. CD11c+ cells were isolated by positive selection on MACS vs+ type column. Rat anti-mouse FcγR mAbs (BD PharMingen) were used to block FcγR nonspecific binding. Approximately 106 cells were taken from cell fraction, washed with PBS containing 4% FBS and 0.1% sodium azide (Sigma-Aldrich), and resuspended in 50 μl of the same solution. Cells were stained with anti-CD11c-PE (HL3), and anti-CD11b-FITC, or anti-CD8α FITC (BD PharMingen). Optimal dilution was determined for each antibody. The cell profiles were gated on DCs based on forward and 90° light scatter. Data were analyzed using GraphPad PRISM statistical analysis and graphing software. Unpaired Student’s t test was used to determine differences between two groups. Multiple group comparison was made using ANOVA. A value of p < 0.05 was considered significant. Before treatment with Flt3-L or PBS, we confirmed that OVA-sensitized and -challenged mice had established AHR to methacholine (data not shown). Treatment with Flt3-L caused significant suppression of Penh values for LAR (p < 0.01; Fig. 2⇓B), with no significant effect on EAR (Fig. 2⇓A). Additionally, treatment with Flt3-L induced a significant reduction in AHR in response to methacholine to levels comparable to those in PBS-treated mice (Fig. 3⇓). None of the sensitized nontreated mice with pre-existing AHR exhibited change in the EAR, LAR, and AHR. EAR and LAR were assessed by analyzing pulmonary function in Penh values with whole body plethysmograph, as described in Materials and Methods. EAR was calculated as the mean area under the curve (AUC) within 0–15 min (A), and LAR was calculated as the mean AUC within 1–6 h (B) after final challenge with OVA on day 43. Treatment with Flt3-L caused a significant suppression (p < 0.01) of LAR (B) compared with untreated OVA-sensitized and -challenged mice. Data are shown as the mean ± SEM (n = 6–8 mice/experimental group). AHR to methacholine (Mch) in unrestrained mice. After OVA sensitization and challenge, AHR to Mch was established on day 33, followed by 10-day treatment with Flt3-L (6 μg/day i.p.). On day 44 the AHR to Mch was again measured, and Penh values were recorded. Data are shown as the mean ± SEM (n = 6–8 in each experimental group). ∗, p < 0.05; ∗∗, p < 0.01. 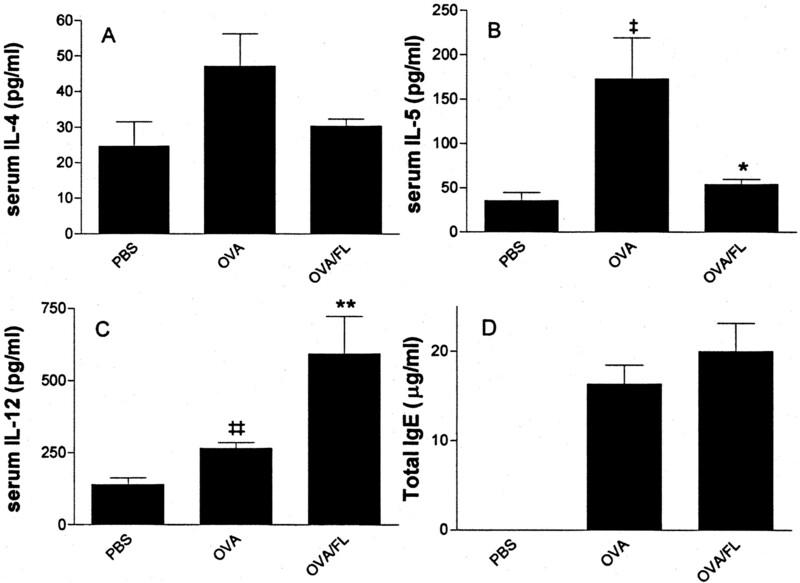 OVA sensitization and challenge significantly increased the total number of cells in the BALF with predominant increase in eosinophils and neutrophils (Table I⇓). Treatment with Flt3-L significantly lowered the total number of cells and eosinophils in BALF (Table I⇓). Treatment with Flt3-L significantly increased serum IL-12 levels (Fig. 4⇓C) and significantly decreased serum IL-5 levels (Fig. 4⇓B). There was no significant effect of Flt3-L on serum IL-4 levels (Fig. 4⇓A). IFN-γ levels were not detectable in any of the samples. Treatment with Flt3-L also caused a significant reduction in total and anti-OVA IgG subclasses (Table II⇓). However, there was no significant change in the serum total IgE concentration (Fig. 4⇓D). Effect of Flt3-L treatment on serum cytokines and total IgE levels in mice. Mice were sensitized and challenged with OVA, and AHR to methacholine was established on day 33. Starting on day 33 mice were administered Flt3-L (6 μg i.p.) daily for 10 days. On day 44, after recording pulmonary functions for EAR, LAR, and AHR, blood was collected to measure serum IL-4 (A), serum IL-5 (B), serum IL-12 (C), and serum total IgE (D). Data are shown as the mean ± SEM (n = 6–8). ∗, p < 0.05; ∗∗∗, p < 0.001 (compared with OVA group). ‡, p < 0.05; ‡‡, p < 0.001 (compared with PBS group). We observed a significant increase over control values in TNF-α, IL-2, IL-4, and IL-5 concentrations in the BALF of OVA-sensitized and challenged mice (Fig. 5⇓). Interestingly, there was a generalized decrease in all these cytokines in the BALF of Flt3-L-treated mice. IFN-γ was not detectable in BALF. Effect of Flt3-L treatment on BALF cytokines levels in mice. BAL fluid samples were immediately centrifuged, and cytokines in supernatants were measured by flow cytometric analysis using the mouse Th1/Th2 cytokine cytometric bead array (CBA) kit (BD Biosciences/PharMingen). IFN-γ was not detected in samples. Values are the mean ± SEM for six animals in each group. ∗, p < 0.05; ∗∗∗, p < 0.001 (compared with OVA group). ‡, p < 0.05; ‡‡, p < 0.001 (compared with PBS group). Sensitization and challenge with OVA induced a significant influx of cells into the airways. Treatment with Flt3-L significantly reduced total cellular infiltration (p < 0.01). This reduction was especially prevalent in the number of infiltrating eosinophils (p < 0.0001). To assess the histological effects of Flt3-L on allergen-induced airway inflammation, we analyzed lung tissues after the last methacholine challenge on day 44. In untreated, OVA-sensitized mice, eosinophil infiltration in the bronchial interstitium together with damaged epithelial cells lining was observed (Fig. 6⇓). 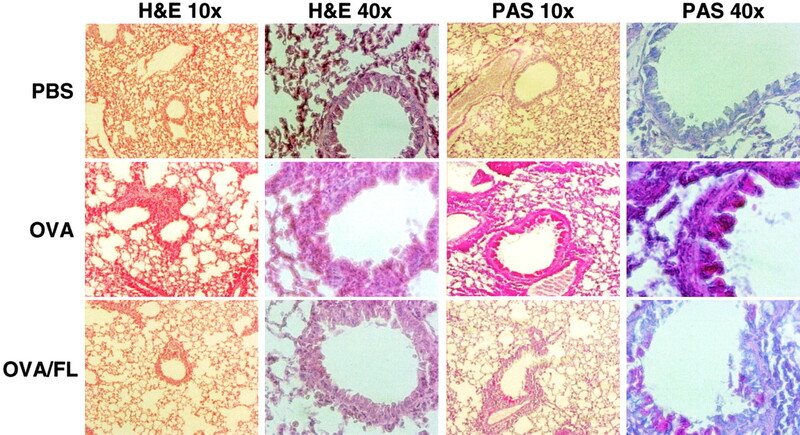 In addition, many mucus-producing cells, as assessed with staining to PAS, were observed in the airways of mice sensitized to OVA (Fig. 6⇓) compared with PBS-treated mice. The airway inflammation was reversed by treatment with Flt3-L. Also, there was a significant reduction in PAS-positive cells in the lungs of the Flt3-L-treated group (Fig. 6⇓). 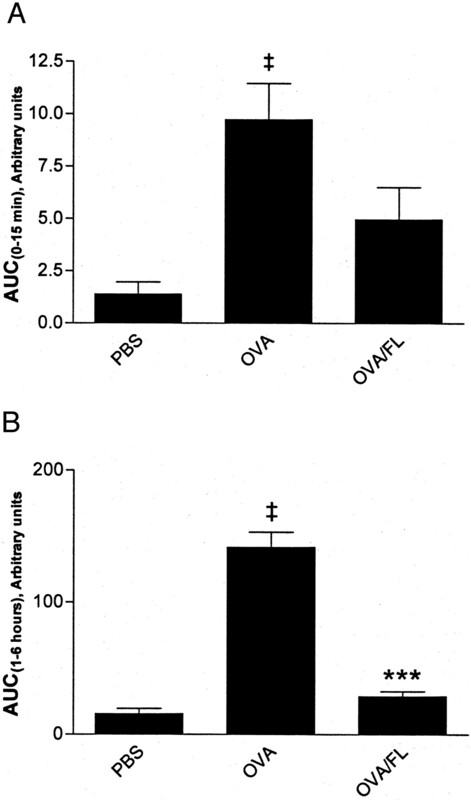 Effect of Flt3-L treatment on airway inflammation in OVA-sensitized mice. Lungs were collected and fixed in 10% buffered formalin. Thin sections (8 μm) were cut, stained with H&E or PAS, and examined at ×10 and ×40 magnification. These data are representative (of at least six mice in each experimental group) lung histology of PBS-treated mice (upper panel), OVA-sensitized and -challenged (OVA) mice (middle panel), and OVA-sensitized and -challenged mice treated with Flt3-L (OVA/FL) for 10 days (lower panel). In the OVA group, massive peribronchial infiltration with eosinophils, thickening of the basement membrane, and de-epithelialization were seen. In contrast, after treatment with Flt3-L, an intact bronchial epithelial layer and no eosinophil infiltration were observed, and histology was comparable to that in the PBS-treated group. The mucus substances are stained in magenta by the PAS reaction. In the OVA group, there was strong staining to PAS (middle panel), which was significantly reduced by Flt3-L treatment (lower panel). OVA sensitization and challenge induced a significant increase in CD11c+CD11b+ (DC2) cells in the lungs (46.2 ± 3.3%) compared with PBS treatment (11.2 ± 0.6%; Table III⇓ and Fig. 7⇓). There was no significant change in CD11c+CD8α+ (DC1) cells in the OVA-sensitized and -challenged group. Interestingly, Flt3-L did not show any significant effect on either CD11c+CD11b+ cells or CD11c+CD8α+ cells (Table III⇓). However, Flt3-L treatment induced a significant increase in CD11c+CD11b− (10.4.± 0.7%) and CD11c+CD8α− (21.6 ± 2.7%) cells (Table III⇓). Representative flow cytometric contour plots showing the fluorescence characteristics of lung DCs. Lungs from nonsensitized (PBS), OVA-sensitized and challenged (OVA), and OVA-sensitized and challenged mice treated with FL (OVA/FL) were digested with collagenase D. CD11c+ cells were isolated by positive selection, followed by labeling with FITC-conjugated CD8α or CD11b Ab and PE-conjugated CD11c antibody. Cumulative data from several animals are shown in Table I⇑. 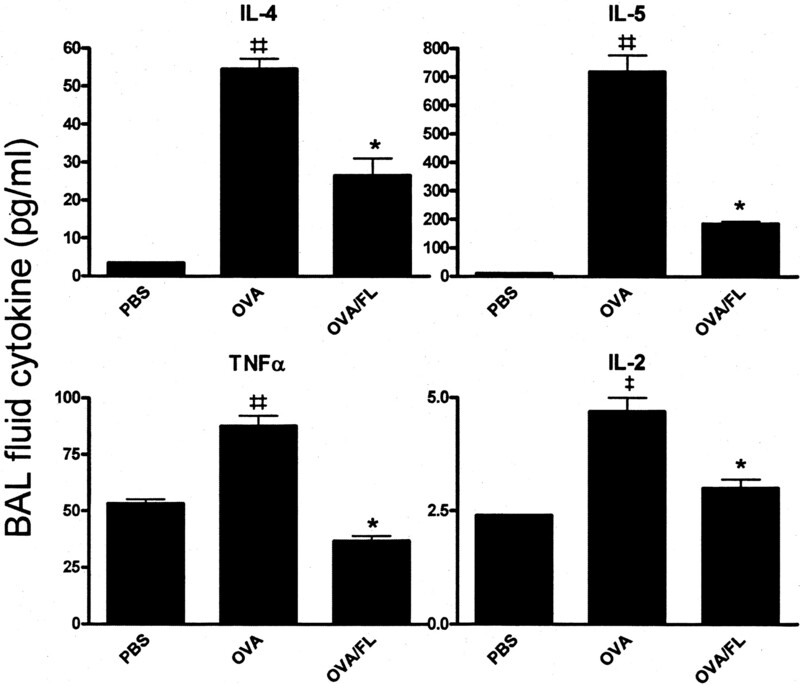 This report presents evidence that Flt3-L is capable of modulating the immune allergic response to Ag in OVA-presensitized and -challenged mice with established AHR. This model of allergic airway inflammation has been reported to elicit type 2 T cell responses and is characterized by eosinophilic infiltration into the airways and nonspecific AHR. Previously, we demonstrated that Flt3-L, administered before sensitization to Ag, was capable of preventing the development of airway inflammation and AHR (36). In this study we report the potent therapeutic effect of Flt3-L to reverse established AHR, LAR, and BALF eosinophilia for the first time. The therapeutic effect of Flt3-L on allergic airway inflammation and pulmonary functions was associated with a significant decrease in type 2 cytokines and an increase in IL-12 levels. The results presented in this paper suggest that Flt3-L treatment may differentially regulate the Th1/Th2 balance of the allergic immune response. We did not observe any significant effect of Flt3-L treatment on EAR. EAR is primarily mediated by mast cells and basophils that are activated by cross-linking of their surface IgE with specific allergens, resulting in the degranulation and release of both preformed and newly formed mediators of inflammation. The inability of Flt3-L to significantly attenuate EAR was consistent with the finding that Flt3-L treatment had no effect on either serum IgE or IL-4 levels. Several other immunomodulators, including mycobacterial Ags, have been reported to exert no effect on serum IgE or IL-4 levels and failed to prevent EAR (2). These data suggest that immunomodulators such as Flt3-L can significantly attenuate LAR and AHR without affecting EAR. Indeed, Kay and colleagues (41) have reported that LAR and AHR are not dependent on EAR. The role of IL-4 has been identified in the development of allergic inflammation. Augmented levels of IL-4 in BALF (42) and increased expression of IL-4 mRNA in BAL cells (43, 44) have been recognized in patients with allergic inflammation. In murine models, IL-4 has been reported to be important for the development of allergic airway inflammation (45, 46, 47) and AHR (48, 49). In our study we observed a significant decrease in BALF IL-4 levels. However, there was no significant effect of Flt3-L treatment on serum IL-4 and serum IgE levels. This suggests that the abrogation of AHR and asthma-like parameters is independent of IL-4 and IgE. Alternatively, it is possible that 10-day treatment with Flt3-L might not be sufficient to remove previously existing antibodies. This was supported by a recent publication by Peng and colleagues (50), who reported that vaccination with CpG oligodeoxynucleotides prevented the induction of IgE production by B cells, but did not eliminate previously produced IgE. In addition, IgE might not be required for the development of eosinophilic airway inflammation and AHR in mice, as reported by several investigators (5, 51, 52). There have been several reports associating the elevated production of IgG2a with the Th1 response (53, 54, 55). However, IgG1 has been associated with atopic allergy and asthma (56). In this study we observed a significant increase in both total and anti-OVA IgG subclasses (IgG2a and IgG1) after OVA sensitization and challenge. Flt3L caused a significant reduction in both total and anti-OVA IgG subclasses (Table II⇑). Our results are in agreement with a previous study (57) in which mice were treated with Flt3-L for 10 days and then immunized with hen egg lysozyme, and Flt3L treatment significantly lowered the levels of anti-hen egg lysozyme IgG subclasses in serum compared with those in the nontreated group, indicating that Flt3-L treatment modulated the induction of the Ab response. Interestingly, treatment with toxins, such as cholera toxin (57) and tetanus toxoid (58), after Flt3-L stimulation resulted in significantly higher levels of IgGs. Thus, Flt3-L has the potential to elicit immunomodulatory effects. The role of IL-5 in the development of AHR and allergic airway inflammation has been controversial. In our study we observed a significant increase in both serum and BALF IL-5 levels after Ag sensitization and challenge, and IL-5 levels were significantly attenuated by Flt3-L treatment. These data suggest that the reduction in IL-5 levels after Flt3-L might be one of the factors involved in the attenuation of AHR to methacholine. However, we have yet to examine the mechanistic relationship between the inhibitory effects of Flt3-L on AHR, inflammation, and goblet cell hyperplasia and the decrease in IL-5 levels. The precise mechanism by which Flt3-L treatment mediates its effects is at present not clear, but may be due to potential differences in the repertoire of the DC subsets (59). The factors regulating T cell cytokine polarization are versatile, including DCs, which have an important role in the control of the adaptive immune response (60), implying the functional flexibility of DCs to direct T cell activation into either Th1 or Th2 polarized effectors. The effect of Flt3-L administration on the development and immunogenicity of mouse spleen DCs has been reported (29, 30, 59, 61, 62). However, studies of the effect of Flt3-L on the generation and phenotype of mouse lung DCs are scarce. In a recently published study on the effect of Flt3-L on the lungs by Pabst and colleagues (58), a single dose of 100 μg of Flt3-L intratracheally resulted in an enlargement of the perivascular space in the lung and a significant and rapid expansion of DCs and T cells in the interstitial space. In the lungs, immature DCs act as a sentinel. After Ag challenge they migrate to the draining lymph nodes and efficiently present the captured and processed Ag to Ag-specific naive T cells, initiating the development of the primary effector T cell response (63). In this study we observed that allergic airway inflammation due to sensitization and challenge with OVA induced a marked increase in the total number of lung CD11c+CD11b+ cells. This increase in DC2-type cells could be due to increased levels of cytokines, such as TNF-α and GM-CSF, that are involved in differentiation of immature DCs to mature DCs. We have not measured GM-CSF levels in this study. However, Flt3-L treatment significantly decreased BALF TNF-α levels with no effect on DC2 cells. This might suggest that cytokines other than TNF-α are involved in the differentiation and maturation of DC2 cells in the lung. Flt3-L treatment significantly altered the profile of CD11c+ in the lungs, with an increase in the number of CD11c+ CD11b− (p < 0.05) and CD11c+ CD8α− cells. However, there was no effect of Flt3-L on either CD11c+CD8α+ or CD11c+ CD11b+ cells. Therefore, the increase in total CD11c+ cells could be due to immature DCs, which have been implicated in the induction of peripheral tolerance (64). It has recently been demonstrated that a distinct subset of DCs with the phenotype CD11clow CD45RBhigh has the ability to secrete IL-10 and induce tolerance and T regulatory cell differentiation (65). It has also been shown that IL-12 production by immature DCs is susceptible to inhibition by IL-10-producing T regulatory cells (66, 67). In addition, DCs induce selective expansion of regulatory T cells, producing immunosuppressive cytokines such as IL-10 and TGF-β (68, 69, 70). Therefore, it is reasonable to speculate that the Flt3-L-induced effects on LAR, AHR, and allergic airway inflammation are mediated via induction of immature DCs in the lungs. This could be supported by our recent finding that i.m. administration of Flt3-L plasmid increased CD11c+ CD45+ cells in the lungs by 5-fold (our unpublished observations). This suggests that marked proliferation of immature DCs expressing few or no costimulatory molecules in response to Flt3-L treatment might have the potential to induce tolerance. In summary, we report that treatment with Flt3-L can suppress the LAR, AHR to methacholine, serum IL-5, and BALF IL-5 and IL-4, and significantly elevate serum IL-12 levels in established model of allergic airway inflammation. Although more investigation is warranted to define the duration of this effect and the dose-dependency of Flt3-L, these results support the hypothesis that Flt3-L may be an effective immunotherapeutic agent in the treatment of allergic airway inflammation and associated changes in pulmonary functions. ↵1 This work was supported by National Institutes of Health Grants R01HL070885 to (D.K.A.) and R01HL073349 to (D.K.A.). ↵3 Abbreviations used in this paper: Flt3-L, Flt3 ligand; AHR, airway hyper-responsiveness; BAL, bronchoalveolar lavage; BALF, BAL fluid; DC, dendritic cell; EAR, early allergic response; LAR, late allergic response; PAS, periodic acid-Schiff; Penh, enhanced pause. Busse, W. W., R. F. Lemanske, Jr. 2001. Asthma. N. Engl. J. Med. 344:350. Hopfenspirger, M. T., S. K. Parr, R. J. Hopp, R. G. Townley, D. K. Agrawal. 2001. Mycobacterial antigens attenuate late phase response, airway hyperresponsiveness, and bronchoalveolar lavage eosinophilia in a mouse model of bronchial asthma. Int. Immunopharmacol. 1:1743. Janssen, E. M., A. J. van Oosterhout, A. J. van Rensen, W. van Eden, F. P. Nijkamp, M. H. Wauben. 2000. Modulation of Th2 responses by peptide analogues in a murine model of allergic asthma: amelioration or deterioration of the disease process depends on the Th1 or Th2 skewing characteristics of the therapeutic peptide. J. Immunol. 164:580. Kato, Y., T. Manabe, Y. Tanaka, H. Mochizuki. 1999. Effect of an orally active Th1/Th2 balance modulator, M50367, on IgE production, eosinophilia, and airway hyperresponsiveness in mice. J. Immunol. 162:7470. Michael, T. H., K. P. Sharidan, G. T. Robert, K. A. Devendra. 2002. Attenuation of allergic airway inflammation and associated pulmonary functions by mycobacterial antigens is independent of IgE in a mouse model of asthma. Allergol. Int. 51:21. Tomkinson, A., C. Duez, G. Cieslewicz, J. C. Pratt, A. Joetham, M. C. Shanafelt, R. Gundel, E. W. Gelfand. 2001. A murine IL-4 receptor antagonist that inhibits IL-4- and IL-13-induced responses prevents antigen-induced airway eosinophilia and airway hyperresponsiveness. J. Immunol. 166:5792. Zuany-Amorim, C., S. Haile, D. Leduc, C. Dumarey, M. Huerre, B. B. Vargaftig, M. Pretolani. 1995. Interleukin-10 inhibits antigen-induced cellular recruitment into the airways of sensitized mice. J. Clin. Invest. 95:2644. Erb, K. J.. 1999. Atopic disorders: a default pathway in the absence of infection?. Immunol. Today 20:317.
von Hertzen, L. C., T. Haahtela. 2000. Could the risk of asthma and atopy be reduced by a vaccine that induces a strong T-helper type 1 response?. Am. J. Respir. Cell Mol. Biol. 22:139. O’Garra, A., K. Murphy. 1994. Role of cytokines in determining T-lymphocyte function. Curr. Opin. Immunol. 6:4586. Johansson, S. G., T. Haahtela, P. M. O’Byrne. 2002. Omalizumab and the immune system: an overview of preclinical and clinical data. Ann. Allergy Asthma Immunol. 89:132. Mauser, P. J., A. M. Pitman, X. Fernandez, S. K. Foran, G. K. Adams, III, W. Kreutner, R. W. Egan, R. W. Chapman. 1995. Effects of an antibody to interleukin-5 in a monkey model of asthma. Am. J. Respir. Crit. Care Med. 152:467. Cheng, G., M. Arima, K. Honda, H. Hirata, F. Eda, N. Yoshida, F. Fukushima, Y. Ishii, T. Fukuda. 2002. Anti-interleukin-9 antibody treatment inhibits airway inflammation and hyperreactivity in mouse asthma model. Am. J. Respir. Crit Care Med. 166:409. Isolauri, E., T. Arvola, Y. Sutas, E. Moilanen, S. Salminen. 2000. Probiotics in the management of atopic eczema. Clin. Exp. Allergy 30:1604. Kandimalla, E. R., D. Yu, Q. Zhao, S. Agrawal. 2001. Effect of chemical modifications of cytosine and guanine in a CpG-motif of oligonucleotides: structure-immunostimulatory activity relationships. Bioorg. Med. Chem. 9:807. Nahori, M. A., M. Lagranderie, J. Lefort, F. Thouron, D. Joseph, N. Winter, B. Gicquel, J. R. Lapa e Silva, B. B. Vargaftig. 2001. Effects of Mycobacterium bovis BCG on the development of allergic inflammation and bronchial hyperresponsiveness in hyper-IgE BP2 mice vaccinated as newborns. Vaccine 19:1484. Hopfenspirger, M. T., D. K. Agrawal. 2002. Airway hyperresponsiveness, late allergic response, and eosinophilia are reversed with mycobacterial antigens in ovalbumin-presensitized mice. J. Immunol. 168:2516. Aaby, P., S. O. Shaheen, C. B. Heyes, A. Goudiaby, A. J. Hall, A. W. Shiell, H. Jensen, A. Marchant. 2000. Early BCG vaccination and reduction in atopy in Guinea-Bissau. Clin. Exp. Allergy 30:644. Shirakawa, T., T. Enomoto, S. Shimazu, J. M. Hopkin. 1997. The inverse association between tuberculin responses and atopic disorder. Science 275:77. Abou-Rebyeh, H., H. Naher, H. Hahn. 1992. Delayed type hypersensitivity (DTH): quantitative studies of mycobacteria-induced destructive and non-destructive DTH-reactions in the skin of guinea pigs. Zentralbl. Bakteriol. 276:398. Wang, L., M. O. Turner, R. K. Elwood, M. Schulzer, J. M. FitzGerald. 2002. A meta-analysis of the effect of bacille Calmette Guérin vaccination on tuberculin skin test measurements. Thorax 57:804. Barnes, P. J.. 2002. Cytokine modulators as novel therapies for asthma. Annu. Rev. Pharmacol. Toxicol. 42:81. Lyman, S. D., L. James, L. Johnson, K. Brasel, P. de Vries, S. S. Escobar, H. Downey, R. R. Splett, M. P. Beckmann, H. J. McKenna. 1994. Cloning of the human homologue of the murine flt3 ligand: a growth factor for early hematopoietic progenitor cells. Blood 83:2795. Small, D., M. Levenstein, E. Kim, C. Carow, S. Amin, P. Rockwell, L. Witte, C. Burrow, M. Z. Ratajczak, A. M. Gewirtz. 1994. STK-1, the human homolog of Flk-2/Flt-3, is selectively expressed in CD34+ human bone marrow cells and is involved in the proliferation of early progenitor/stem cells. Proc. Natl. Acad. Sci. USA 91:459. Robinson, S., R. L. Mosley, P. Parajuli, V. Pisarev, J. Sublet, A. Ulrich, J. Talmadge. 2000. Comparison of the hematopoietic activity of flt-3 ligand and granulocyte-macrophage colony-stimulating factor acting alone or in combination. J. Hematother. Stem Cell Res. 9:711. Pulendran, B., J. Banchereau, S. Burkeholder, E. Kraus, E. Guinet, C. Chalouni, D. Caron, C. Maliszewski, J. Davoust, J. Fay, et al 2000. Flt3-ligand and granulocyte colony-stimulating factor mobilize distinct human dendritic cell subsets in vivo. J. Immunol. 165:566. Maraskovsky, E., K. Brasel, M. Teepe, E. R. Roux, S. D. Lyman, K. Shortman, H. J. McKenna. 1996. Dramatic increase in the numbers of functionally mature dendritic cells in Flt3 ligand-treated mice: multiple dendritic cell subpopulations identified. J. Exp. Med. 184:1953. Maraskovsky, E., B. Pulendran, K. Brasel, M. Teepe, E. R. Roux, K. Shortman, S. D. Lyman, H. J. McKenna. 1997. Dramatic numerical increase of functionally mature dendritic cells in FLT3 ligand-treated mice. Adv. Exp. Med. Biol. 417:33. Fong, L., Y. Hou, A. Rivas, C. Benike, A. Yuen, G. A. Fisher, M. M. Davis, E. G. Engleman. 2001. Altered peptide ligand vaccination with Flt3 ligand expanded dendritic cells for tumor immunotherapy. Proc. Natl. Acad. Sci. USA 98:8809. Antonysamy, M. A., A. W. Thomson. 2000. Flt3 ligand (FL) and its influence on immune reactivity. Cytokine 12:87. Morelli, A. E., P. J. O’Connell, A. Khanna, A. J. Logar, L. Lu, A. W. Thomson. 2000. Preferential induction of Th1 responses by functionally mature hepatic (CD8α− and CD8α+) dendritic cells: association with conversion from liver transplant tolerance to acute rejection. Transplantation 69:2647. Bontkes, H. J., T. D. De Gruijl, G. J. Schuurhuis, R. J. Scheper, C. J. Meijer, E. Hooijberg. 2002. Expansion of dendritic cell precursors from human CD34+ progenitor cells isolated from healthy donor blood; growth factor combination determines proliferation rate and functional outcome. J. Leukocyte Biol. 72:321. Agrawal, D. K., M. T. Hopfenspirger, J. Chavez, J. E. Talmadge. 2001. Flt3 ligand: a novel cytokine prevents allergic asthma in a mouse model. Int. Immunopharmacol. 1:2081. Hamelmann, E., J. Schwarze, K. Takeda, A. Oshiba, G. L. Larsen, C. G. Irvin, E. W. Gelfand. 1997. Noninvasive measurement of airway responsiveness in allergic mice using barometric plethysmography. Am. J. Respir. Crit Care Med. 156:766. Chong, B. T., D. K. Agrawal, F. A. Romero, R. G. Townley. 1998. Measurement of bronchoconstriction using whole-body plethysmograph: comparison of freely moving versus restrained guinea pigs. J. Pharmacol. Toxicol. Methods 39:163. Dohi, M., S. Tsukamoto, T. Nagahori, K. Shinagawa, K. Saitoh, Y. Tanaka, S. Kobayashi, R. Tanaka, Y. To, K. Yamamoto. 1999. Noninvasive system for evaluating the allergen-specific airway response in a murine model of asthma. Lab. Invest. 79:1559. Haselden, B. M., M. Larche, Q. Meng, K. Shirley, R. Dworski, A. P. Kaplan, C. Bates, D. S. Robinson, S. Ying, A. B. Kay. 2001. Late asthmatic reactions provoked by intradermal injection of T-cell peptide epitopes are not associated with bronchial mucosal infiltration of eosinophils or TH2-type cells or with elevated concentrations of histamine or eicosanoids in bronchoalveolar fluid. J. Allergy Clin. Immunol. 108:394. Walker, C., E. Bode, L. Boer, T. T. Hansel, K. Blaser, J. C. Virchow, Jr. 1992. Allergic and nonallergic asthmatics have distinct patterns of T-cell activation and cytokine production in peripheral blood and bronchoalveolar lavage. Am. Rev. Respir. Dis. 146:109. Robinson, D. S., Q. Hamid, S. Ying, A. Tsicopoulos, J. Barkans, A. M. Bentley, C. Corrigan, S. R. Durham, A. B. Kay. 1992. Predominant TH2-like bronchoalveolar T-lymphocyte population in atopic asthma. N. Engl. J. Med. 326:298. Robinson, D. S., Q. Hamid, M. Jacobson, S. Ying, A. B. Kay, S. R. Durham. 1993. Evidence for Th2-type T helper cell control of allergic disease in vivo. Springer Semin. Immunopathol. 15:17. Brusselle, G., J. Kips, G. Joos, H. Bluethmann, R. Pauwels. 1995. Allergen-induced airway inflammation and bronchial responsiveness in wild-type and interleukin-4-deficient mice. Am. J. Respir. Cell Mol. Biol. 12:254. Brusselle, G. G., J. C. Kips, J. H. Tavernier, J. G. van der Heyden, C. A. Cuvelier, R. A. Pauwels, H. Bluethmann. 1994. Attenuation of allergic airway inflammation in IL-4 deficient mice. Clin. Exp. Allergy. 24:73. Coyle, A. J., C. Bertrand, S. Tsuyuki, H. Pircher, S. Walti, G. Le Gros, F. Erard. 1996. IL-4 differentiates naive CD8+ T cells to a “Th2-like” phenotype: a link between viral infections and bronchial asthma. Ann. NY Acad. Sci. 796:97. Venkayya, R., M. Lam, M. Willkom, G. Grunig, D. B. Corry, D. J. Erle. 2002. The Th2 lymphocyte products IL-4 and IL-13 rapidly induce airway hyperresponsiveness through direct effects on resident airway cells. Am. J. Respir. Cell Mol. Biol. 26:202. Kips, J. C., G. G. Brusselle, G. F. Joos, R. A. Peleman, R. R. Devos, J. H. Tavernier, R. A. Pauwels. 1995. Importance of interleukin-4 and interleukin-12 in allergen-induced airway changes in mice. Int. Arch. Allergy Immunol. 107:115. Peng, Z., H. Wang, X. Mao, K. T. HayGlass, F. E. Simons. 2001. CpG oligodeoxynucleotide vaccination suppresses IgE induction but may fail to down-regulate ongoing IgE responses in mice. Int. Immunol. 13:3. Hogan, S. P., A. Mould, H. Kikutani, A. J. Ramsay, P. S. Foster. 1997. Aeroallergen-induced eosinophilic inflammation, lung damage, and airways hyperreactivity in mice can occur independently of IL-4 and allergen-specific immunoglobulins. J. Clin. Invest. 99:1329. Wilder, J. A., D. D. Collie, B. S. Wilson, D. E. Bice, C. R. Lyons, M. F. Lipscomb. 1999. Dissociation of airway hyperresponsiveness from immunoglobulin E and airway eosinophilia in a murine model of allergic asthma. Am. J. Respir. Cell Mol. Biol. 20:1326. Yeung, V. P., R. S. Gieni, D. T. Umetsu, R. H. DeKruyff. 1998. Heat-killed Listeria monocytogenes as an adjuvant converts established murine Th2-dominated immune responses into Th1-dominated responses. J. Immunol. 161:4146. Finkelman, F. D., I. M. Katona, T. R. Mosmann, R. L. Coffman. 1988. IFN-γ regulates the isotypes of Ig secreted during in vivo humoral immune responses. J. Immunol. 140:1022. Snapper, C. M., C. Peschel, W. E. Paul. 1988. IFN-γ stimulates IgG2a secretion by murine B cells stimulated with bacterial lipopolysaccharide. J. Immunol. 140:2121. Nakagawa, T.. 1988. Egg white-specific IgE and IgG subclass antibodies and their associations with clinical egg hypersensitivity. N. Engl. Reg Allergy Proc. 9:67. Baca-Estrada, M. E., C. Ewen, D. Mahony, L. A. Babiuk, D. Wilkie, M. Foldvari. 2002. The haemopoietic growth factor, Flt3L, alters the immune response induced by transcutaneous immunization. Immunology. 107:69. Pabst, R., A. Luhrmann, I. Steinmetz, T. Tschernig. 2003. A single intratracheal dose of the growth factor Fms-like tyrosine kinase receptor-3 ligand induces a rapid differential increase of dendritic cells and lymphocyte subsets in lung tissue and bronchoalveolar lavage, resulting in an increased local antibody production. J. Immunol. 171:325. Pulendran, B., J. Lingappa, M. K. Kennedy, J. Smith, M. Teepe, A. Rudensky, C. R. Maliszewski, E. Maraskovsky. 1997. Developmental pathways of dendritic cells in vivo: distinct function, phenotype, and localization of dendritic cell subsets in FLT3 ligand-treated mice. J. Immunol. 159:2222. D’Amico, A., L. Wu. 2003. The early progenitors of mouse dendritic cells and plasmacytoid predendritic cells are within the bone marrow hemopoietic precursors expressing Flt3. J. Exp. Med. 198:293. Jefford, M., M. Schnurr, T. Toy, K. A. Masterman, A. Shin, T. Beecroft, T. Y. Tai, K. Shortman, M. Shackleton, I. D. Davis, et al 2003. Functional comparison of DCs generated in vivo with Flt3 ligand or in vitro from blood monocytes: differential regulation of function by specific classes of physiologic stimuli. Blood 102:1753. Steinman, R. M., S. Turley, I. Mellman, K. Inaba. 2000. The induction of tolerance by dendritic cells that have captured apoptotic cells. J. Exp. Med. 191:411. Wakkach, A., N. Fournier, V. Brun, J. P. Breittmayer, F. Cottrez, H. Groux. 2003. Characterization of dendritic cells that induce tolerance and T regulatory 1 cell differentiation in vivo. Immunity 18:605. Buelens, C., V. Verhasselt, D. De Groote, K. Thielemans, M. Goldman, F. Willems. 1997. Human dendritic cell responses to lipopolysaccharide and CD40 ligation are differentially regulated by interleukin-10. Eur. J. Immunol. 27:1848. Faria, A. M., R. Maron, S. M. Ficker, A. J. Slavin, T. Spahn, H. L. Weiner. 2003. Oral tolerance induced by continuous feeding: enhanced up-regulation of transforming growth factor-β/interleukin-10 and suppression of experimental autoimmune encephalomyelitis. J. Autoimmun. 20:135. Jonuleit, H., E. Schmitt, G. Schuler, J. Knop, A. H. Enk. 2000. Induction of interleukin 10-producing, nonproliferating CD4+ T cells with regulatory properties by repetitive stimulation with allogeneic immature human dendritic cells. J. Exp. Med. 192:1213. Jonuleit, H., E. Schmitt, M. Stassen, A. Tuettenberg, J. Knop, A. H. Enk. 2001. Identification and functional characterization of human CD4+CD25+ T cells with regulatory properties isolated from peripheral blood. J. Exp. Med. 193:1285.